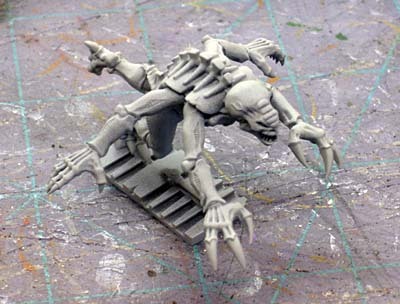 One of my big concerns with the Space Hulk commission I have is getting the Genestealers right. With 23 of them to do, it needs to be a quick and effective technique or I won't be done until sometime next year. With the test arm I did the other night, I expanded that to the whole model and it worked out pretty well. It's still a good amount of work but I think the end result is worth it. I started with a grey primer for this guy so the lighter colors stayed brighter. While the majority of the model is dark, I wanted those bright areas to pop. The first step is the skin. 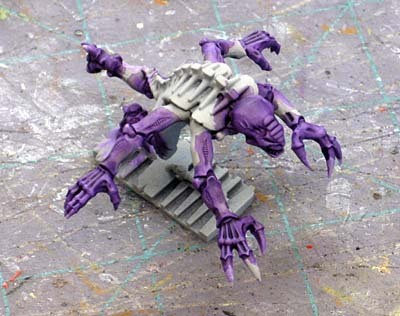 A light purple that goes on quick and since he's primed grey, it retains a good amount of it's brightness. A quick wash with Leviathan Purple to add the shadows. 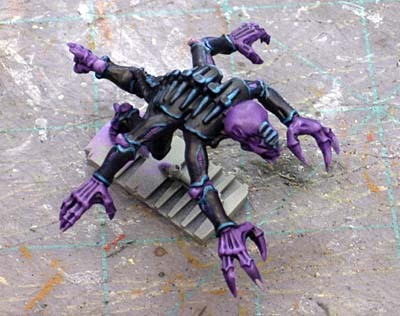 Next up is his carapace with a dark blue. This is really time consuming since I have to be careful and there are four arms on each one of these guys. Now I highlight the carapace. A light blue is line highlighted over the prominent edges across the whole model. Then the carapce is given a wash of Asurmen Blue. This darkens the highlight and blends it into the carapace color. After that dries, I go back with the original highlight color and hit each joint to make the edges really pop. Coming around the home stretch, I go back in with the original skin color and highlight the skin areas. I paint the eyes, claws, teeth and tongue at this point too. All that's left now is the base. I may still go back and add another highlight to the purple areas, I'll have to look at the lot of them once finished. The other thing I'm going to do is take him to my FLGS (Game Vault) and try him out on some of the actual board pieces. I want his base to match the board as close as possible so that it blends in and you don't really notice it. I've actually given the base another wash with black paint so that it's much darker now. This will help me when it comes to finishing the bases of the Marines who don't have much detail on them at all. I'm still leaving the "metal works" there, I'm only applying that last black wash to darken the edges and flat areas of the bases. WOW Ron, a cool 'steeler, I must confess all of my 'steelers from the space hulk box have not been primed, though I have done the terminators from the game in deathwing colours. And thanks for the welcome. 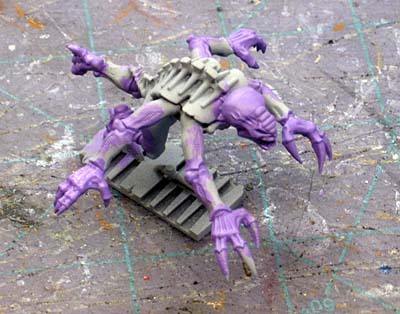 Excellent post and a good step-by-step... it makes me wan't to break out my old genestealers and repaint them! I like how you did it. 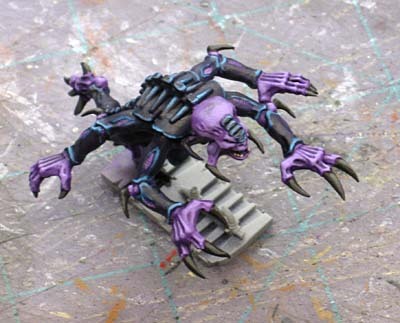 It's easy to paint Tyranids. But difficult to paint some that are great looking and easy to paint. Alvin: Mmmmm... I don't know that they're easy to paint. I do know that if you take your time, they'll turn out great looking. But they're not really easy. They look really great, ron! I kinda wish I had done mine this way now. thanks Ron, was looking everywhere for a good Space Hulk 3rd Ed. 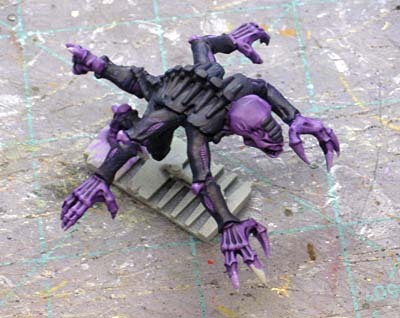 genestealer how to. Cande2105: No problem, glad it helps!